In the post ICEL translation - don't try this at home, I mentioned the ludicrous assertion made in the Tablet that the Pope is not a trained liturgist. This is occasionally taken seriously and therefore it was interesting to read a quotation, passed on to me by a correspondent, from the former Master of Papal Liturgical Celebrations, Archbishop Piero Marini (not to be confused with his successor Mgr Guido Marini). [...] fin dal primo momento mi sono sentito accolto da Papa Benedetto come un figlio. In lui ho potuto conoscere, con mia viva soddisfazione, non solo un Professore ma un Papa esperto in liturgia. 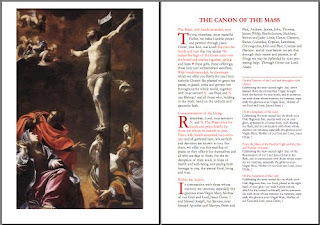 Following my post Lay apostolate in the tradition of the CTS, a correspondent sent me a link to this page from Australia: Catholic Truth Society Pamphlets. From various countries. There are so far 270 clean pdfs of old pamphlets from Australia, England, and Ireland. It is quite a treasure trove. The illustration for this post is from Lux Occulta. If you go there you can click on the picture and read the whole pamphlet in a pdf. I think that it might be of interest to those who write on "The Art of Manliness". The back cover is interesting too because it shows the CTS bookshop before the Piazza was cleared. 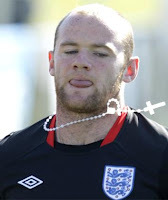 "Celebrating the Papal Visit. Your spiritual companion" sounds a promising title. I'm keen to promote anything good that comes my way as a parish priest so this was one piece of mail I put aside to read over coffee. Inside the four page leaflet produced by the Redemptorists, there is an article about how it is not easy to be a Catholic, accompanied by a related "Hot topic" piece. Laurence England has kindly typed them out so you can read both articles over at The Bones. 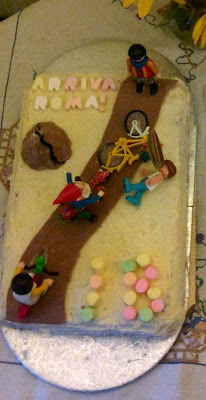 After the end of the Via Romea cycling pilgrimage to Rome, I was invited to the family home for dinner and this cruel but celebratory cake. It shows Gregory fallen off the bicycle, Joseph as Big Ears and Anna Marie in last place. All agreed it was "Not Fair!" Two respected Vaticanisti, Paolo Rodari and Andrea Tornielli, have written a book analysing the various occasions during Pope Benedict's papacy when he has been subjected to fierce attack in the media: Attacco a Ratzinger: Accuse e scandali, profezie e complotti ("Attack on Ratzinger: Accusations and Scandals, Prophecies and Plots"). There is a lengthy review (in Italian) by Massimo Introvigne: I tre nemici del Papa (The three enemies of the Pope). 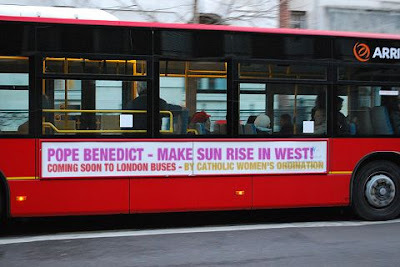 I was reading this when a tweet came up with a link to an even longer review by John Allen: 'Attack on Ratzinger': Italian book assesses Benedict's papacy. 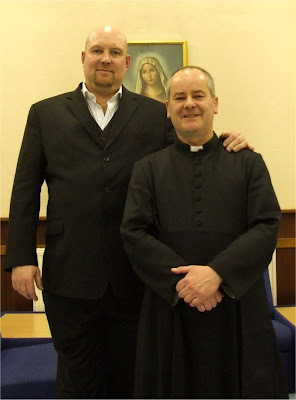 Thanks to Fr Stephen Boyle for this video of John Pridmore at the Church of the Good Shepherd, New Addington at a mission earlier this year, taken by one of his parishioners. 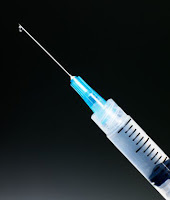 Go over to Marcel's post to check whether your own blogging bishop is there. It would be good if someone built up a list of Bishop bloggers worldwide. I don't think we have any in England yet, but do correct me if I am wrong. The Holy Father has continued the custom that he maintained as a Cardinal, of meeting each summer with his former students of theology at Tübingen and Regensburg. 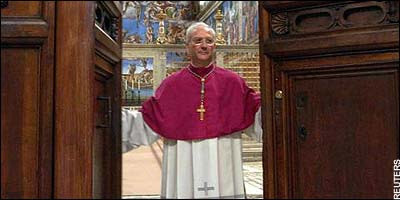 Since he has become Pope, the meetings have been held at Castel Gandolfo. This year, the theme is the hermeneutics (or interpretation) of the Second Vatican Council. The video above has a clip of the Holy Father giving his speech to the Roman Curia in December 2005. That speech was the inspiration for this blog. The Journal of Medical Ethics recently published research by Clive Searle: "The role of doctors’ religious faith and ethnicity in taking ethically controversial decisions during end-of-life care." The full paper is only available to subscribers. (A doctor kindly forwarded me a copy to read but obviously I can't put it on the internet myself.) There is an abstract freely available online. 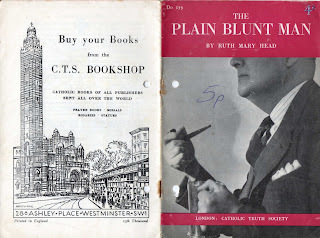 Shane has started an interesting new blog called Lux Occulta in which he has posted scans of the covers of various old Catholic Truth Society (CTS) pamphlets. 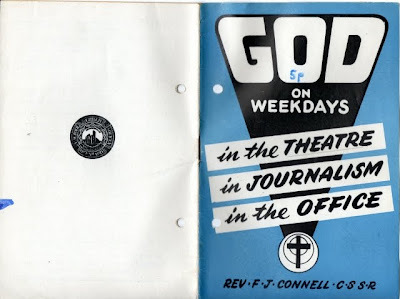 Many have an advert for the old CTS bible (Douai Rheims) on the back, priced 6/- for the blue cloth bound version and 8/6d for the maroon leatherette version. I have a copy of the blue cloth version but do remember as a child wondering if I might be able to afford the luxury leatherette version one day! 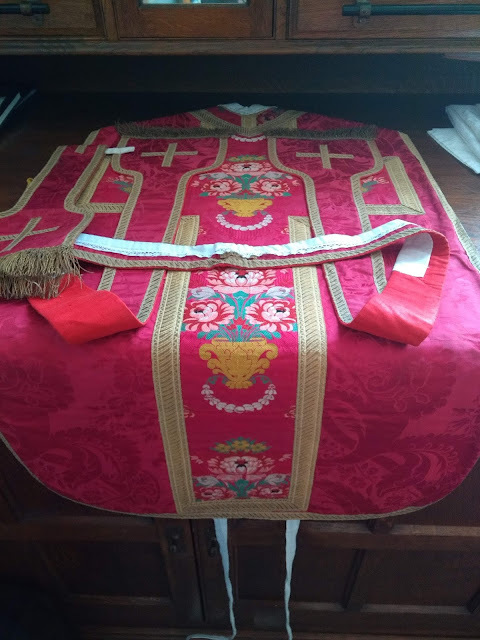 Joseph Shaw has written a series of posts about the walking pilgrimage from Ely to Walsingham which was held by the Latin Mass Society for the first time this year: See his posts from 20-22 August. He also has plenty of photos at his flickr set. Above you can see Fr Alex Redman walking in the pilgrimage in cassock, cotta and stole. Hardnut! If you have done a walking pilgrimage, you will know what I mean. Fifty miles might sound simple but it is enough to do your feet in comprehensively if anything is slightly out of kilter, and any minor discomfort can magnify over the miles. Paul Smeaton got the idea going for the Pilgrimage so congratulations to him for pulling it off and to the walkers for doing the distance. You can bet that this will become a much loved and cherished tradition among them. 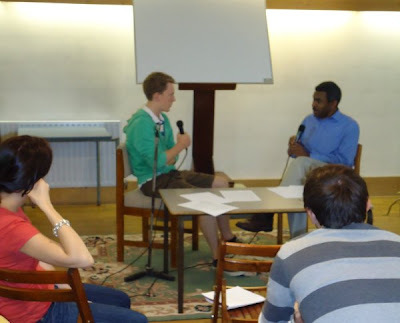 Family Life International had a training day for young people in London recently, in which teenagers and young adults were put through a grilling on Catholic issues by an experienced Catholic media expert acting as "devil's advocate", posing as someone in favour of abortion, condom distribution and so on. The interviews were followed by analysis and instruction on better arguments and techniques to use. This is a great idea and it is wonderful to hear that some of our good Catholics are preparing for battle while still young. Two teenagers from my parish took part and wrote to me to say how helpful and enjoyable the day was. They are keen to do more so that they can build up their confidence. BTW One of them got his GCSE results today and did very well so send up a prayer of thanksgiving. God has obviously forgiven him for those terrible socks. 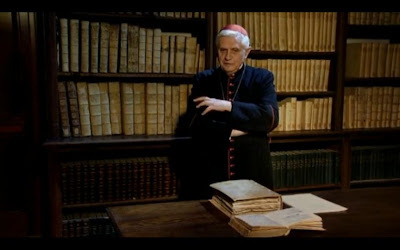 A correspondent sent me the link to this video by Journeyman Pictures calle Pope Benedict XVI - My Vatican. There is a (very) irritating advert at the beginning and a few statements with which we would take issue, but on the whole it is a well produced and sympathetic documentary with some fascinating comments by Cardinal Ratzinger when he was Prefect of the Congregation for the Doctrine of the Faith. 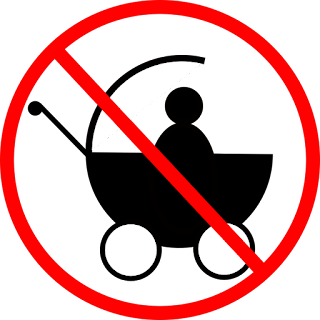 Embedding is disabled (why would anyone want to choose that option?) so here is the link. It’s kinda murky as to who in the Vatican got their fingerprint on this at the last moment.Quite so. 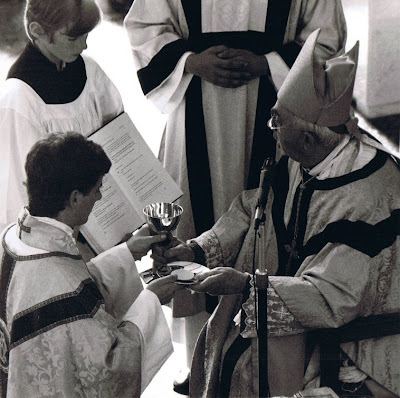 Leaving that slight annoyance aside, it is interesting that Mgr Guido Marini, the Master of Pontifical Liturgical Celebrations recently spoke about the liturgical texts to be used during the Papal Visit to Britain next month and referred to the ordinary as having been approved a while ago. At the northern end of the large open space which begins with the Palais du Papes in Avignon, there is the Petit Palais which was extensively modified by Guiliano della Rovere who became Pope Julius II (known as Il Papa Terribile) who gave the dispensation for Henry VIII to marry Katherine of Aragon, and founded the Swiss Guard, among his other claims to fame. Giovanni Pagani of Monterubbiano in the Marches (d.1545) painted this unusual Vierge du Secours in which Our Lady illustrates the military maxim "Talk softly and carry a big stick." While I was away, I read several news reports on the final decision of the Charities Commission concerning Catholic Care, the adoption agency of the Diocese of Leeds, which won the right to appeal against the Commission's earlier ruling that they would have to consider homosexual couples as adoptive parents. The Charities Commission has reconsidered its decision and come back with more of the same. and below is a group gathered afterwards; it was all most edifying. The French Church is by no means dead but you need to know where the life is. It was sad to hear that there was a bomb scare at Lourdes on Sunday, the feast of the Assumption. Everyone had to be evacuated from the Domaine for three hours while the army searched the place. Not pleasant for the people there, but I suppose it is good for Lourdes to have a dry-run evacuation. With the amount of anti-Catholic hatred being whipped up in Europe it is not impossible that places like Lourdes will become real targets. Around 200 million people have visited the shrine since 1860, and the Roman Catholic Church has recognised 67 miracle healings, the last in November 2005. Despite this, the Lourdes (sic) has built up enemies over the years among those who criticise its commercialism. It makes millions from tourism and souvenir selling every year. A response to the elephants of Libera Me. Yesterday morning, Fr Briggs and I took the Eurostar from Ebbsfleet to Paris, crossed from the Gare du Nord to the Gare de Lyon and took the TGV down to Avignon. Readers outside Europe may be unfamiliar with the abbreviation TGV which stands for "train à grande vitesse". It lived up to its word and got us the 430 miles in two hours and 40 minutes as per timetable, averaging over 160mph from start to stop. Francois Mitterand promoted the TGV as a train for everyone, not just a "premier" business service, and that certainly seems to have worked: the train was packed. Yesterday before evening Mass I took my camera out to photograph our Lady Altar which was decorated for the feast of the Assumption. Afterwards, I thought that with the light just after a heavy rainfall, it would be a good opportunity to try and get a good photo of our outside statue, avoiding cars, sheds and buildings. More or less crouching in a puddle, I was rewarded with this one which, I think, might do for a postcard. Gaudeamus omnes in Domino, diem festum celebrantes sub honore beatae Mariae Virginis: de cuius Assumptione gaudent Angeli, et collaudant Filium Dei. Let us all rejoice in the Lord, celebrating the feast day in honour of Blessed Mary the Virgin: in whose Assumption the Angels rejoice, and highly extol the Son of God.I'm not sure that the post-1950 propers with the Signum magnum introit are an improvement. 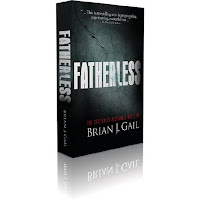 A priest friend has written to let me know of the book Fatherless, One More Soul by Brian J. Gail. A novel set in 1980s Philadelphia, it portrays the spiritual battles fought by Catholics within the Church, focussing on a priest who is led to conversion particularly through understanding the teaching of the Church on the transmission of human life. Unfortunately, the book us currently only available on the UK Amazon site as a Kindle ebook. It can be purchased from the US Amazon site as a paperback. Seeing on Fr Ray Blake's blog that he is back from Downside, I followed his link to have a look at the photos in LMS Chairman, Joseph Shaw's flickr set: LMS Priest Training Conference at Downside. While I was at the Evangelium Conference at the Oratory School, Reading last Saturday, I took the above photo of a piece of school equipment outside the Headquarters of the Combined Cadet Force who formed a guard of honour for the Blessed Sacrament Procession at the school in June. I don't expect that it can be obtained from the standard education supplies catalogues. It was sad to hear that Family Publication had to cease trading. A resourceful priest bought up the copyright to several of their titles so as to facilitate republication. One important title is Dora Nash's "Jesus Comes to Me" which I mentioned when it was first published. Since many parishes use the book for their First Holy Communion course, it has been a cause of anxiety for some priests and catechists that it might now be out of print. I am therefore happy to report that St Pauls are now publishing the book and it is available from them at £6.95. The other day I received video response to my Summorum Pontificum celebration. I was interested in the service provided by xtranormal which enables you to make your own animated videos and have just tried it out.